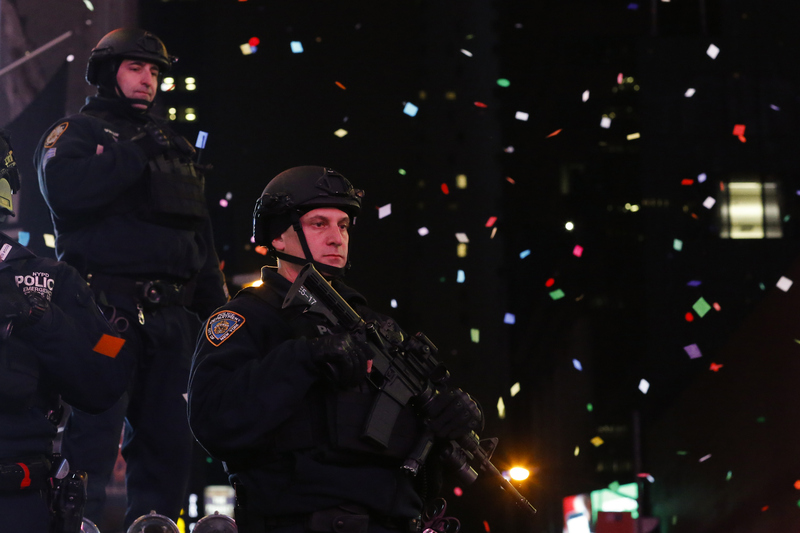 New Year's Eve celebrations in Times Square went off largely without a hitch on Thursday evening, but federal authorities investigating an alleged terror plot said the mood could have been very different. Justice Department officials on Friday announced that a New York man had supposedly planned a terrorist attack meant to target New Year's Eve partygoers in order to pledge allegiance to the Islamic State after receiving direction from an overseas member. Authorities added that the man had been discussing his plans with an undercover federal informant when he was arrested. According to police, 25-year-old Emanuel Lutchman, an ex-convict who served five years for robbery in 2006, had purchased two ski masks, two knives, zip-ties, duct tape, ammonia, latex gloves, and a machete at a nearby Walmart store and was planning on detonating an explosive device inside a club or bar on New Year's Eve. The informant claimed that Lutchman had also planned to kidnap and kill a number of revelers. Justice Department officials on Friday said that they had charged the Rochester man with "attempting to provide material support and resources" to ISIS, a charge that could potentially carry with it a 20-year prison sentence and a $250,000 fine. "The arrest of Emanuel Lutchman is an important reminder of the new normal of global terrorism," New York Gov. Andrew Cuomo said in a statement on Thursday. According to a criminal complaint filed Wednesday, the informant, who was pretending to be Lutchman's accomplice in the attack, said Lutchman had been psyching himself up to carry out the attack in the few days prior to New Year's Eve. "That's on my mind, that's all I been thinking about 'cause I'm getting amped up, to accept the fact that's what I gotta do," Lutchman allegedly told the informant, who provided the 25-year-old with the funds to purchase his materials. "I will take a life, I don't have a problem with that." The criminal complaint also alleged Lutchman was "self-professed Muslim convert," and that he was supposedly levying his terror plot "in furtherance of his plan to join ISIL overseas." Authorities have stated that Lutchman's criminal history included multiple "mental hygiene arrests," a charge in which law enforcement officers may involuntarily take into custody any person who appears to be mentally ill or poses a threat to themselves or others, and place them in an approved treatment center or hospital, pursuant to current New York law. ISIS trend of recruiting mentally ill individuals and promising them protections in exchange for isolated terror attacks is not new; according to recent studies, "more than a handful" of those Americans charged with aiding ISIS militants over the past 20 months have had diagnosed mental illnesses that have required "treat[ment] with psychotropic drugs." Karen Greenberg, director of Fordham University's Center on National Security, told NBC reporters this week that, out of 70 reported ISIS cases, there was "an intersection of factors including youth — 25 and under — with criminal records, diagnosed mental instability, sometimes medicated, and proclivity to violence" and extreme behavior. "These new extreme ideologies are frequently grounded in a religion that gives meaning to pain, provides a community and sense of self, and offers a system of behavior and identity," a June study published by the Georgetown University Security Studies Program explained. "[That is] particularly appealing to psychologically traumatized individuals." In Friday's reports, Lutchman seemed to display a similar line of thinking, telling the informant that his duty was to "kill some kuffar," a derogatory Arabic word used by jihadists to describe non-Muslims. "It's going to get real after this," he told the informant. "It's just you, me, and the Lord — we gotta do this ... precise. If we grab somebody they can't live." Lutchman also allegedly discussed the idea of making a video just prior to the attack, in which the two would explain their motivation and swear bayah (or allegiance) to Islamic State leader Abu Bakr al-Baghdadi. Lutchman appeared in federal court on Thursday. No official trial date has been set.